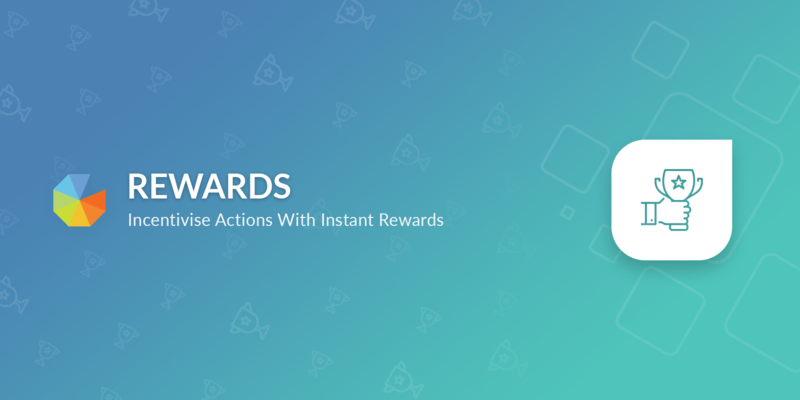 Easily create instant win embeddable rewards in exchange for actions from your users. In this guide we'll take you through the different types of rewards and get an overview of all the features to help maximise your Rewards campaign. Please note that Rewards are not engineered to be used as a customer referral program, they are designed to be redeemed instantly. Gleam is the tool of choice for marketing teams small or large due to its ease of use and flexibility. Rewards is loved by lifestyle bloggers, gamer communities, streamers, e-commerce businesses and more. 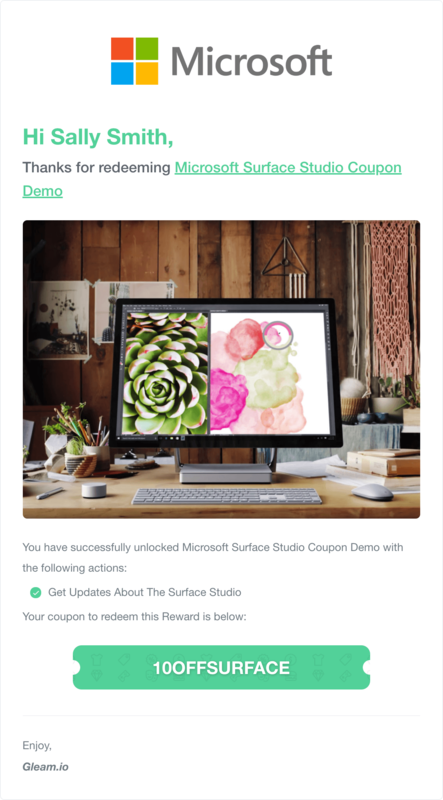 Whether it's user acquisition, community building or you simply want to reward your loyal customers with some freebies, you can achieve that with a Rewards campaign. While Competitions and Rewards both share similar mechanisms in terms of actions, Rewards is meant for all users to win something instantly. If you're looking to host a giveaway or contest that only rewards a set amount of winners after the campaign ends, then Gleam Competitions is a better choice. Rewards campaigns can be run regularly and indefinitely, unlike Competitions where there is a set deadline. How Do I Reward My Users? 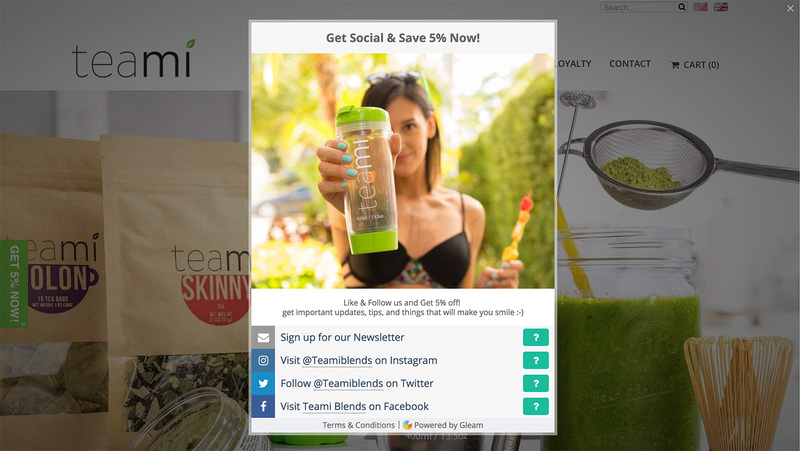 As a retailer you will often run coupon driven campaigns to improve sales & conversion rates. This could be flash sales or end of season sales. The meteoric rise of coupon aggregation websites means that often users will leave your site then come back to convert - losing you 10% of more of the sales revenue (to affiliate fees). Our Coupons reward type allows you to run incentivised coupon offers on any page or as a button that sits across your site. It's designed to retain users, improve conversion rates and also drive actions that you care about. 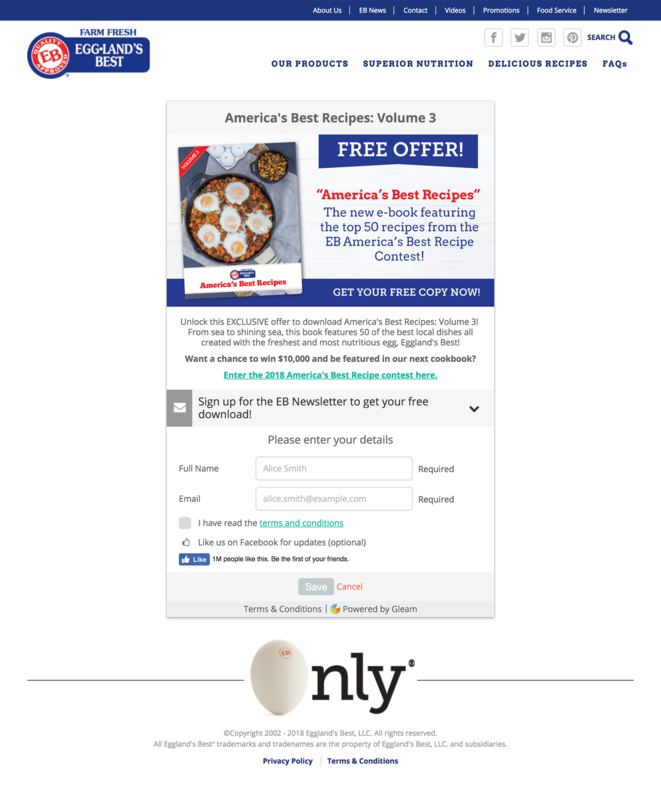 Coupons can be delivered instantly inside the widget or via email. 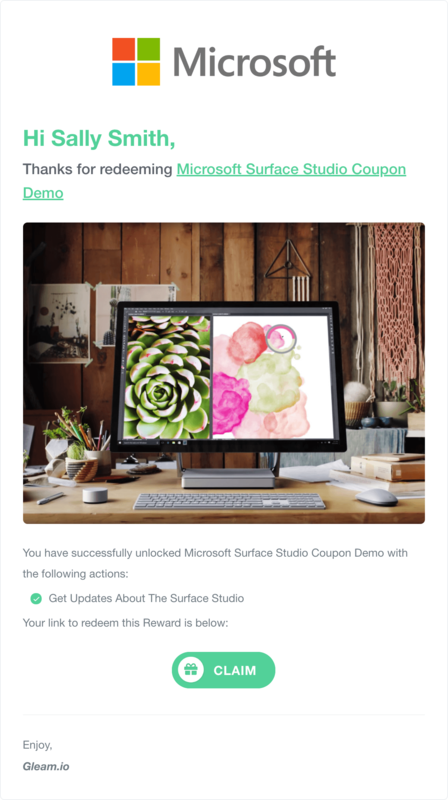 In addition to revealing the coupon in the widget, the user will also get an email with the coupon code emailed to them - provided that you check the Capture user details box during setup. These emails can be customised with your own templates if you upgrade to Business plan. Gated content can be a great way to interact with your audience and provide extra value exclusively. By offering exclusive content or freebies, you will be able to drive powerful actions and build an audience of relevant users who are highly interested in your offering. 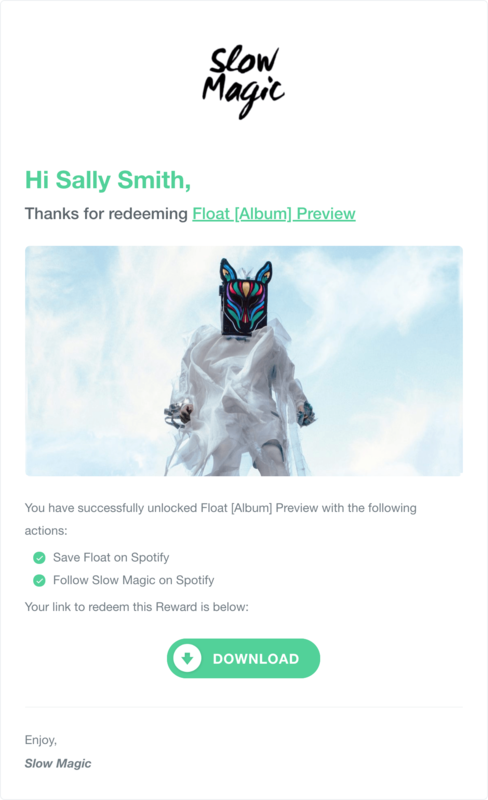 If you have freebies in the form of files such as music, images or documents, then you can use the Downloads reward type to let users download your file directly after interacting with your campaign. 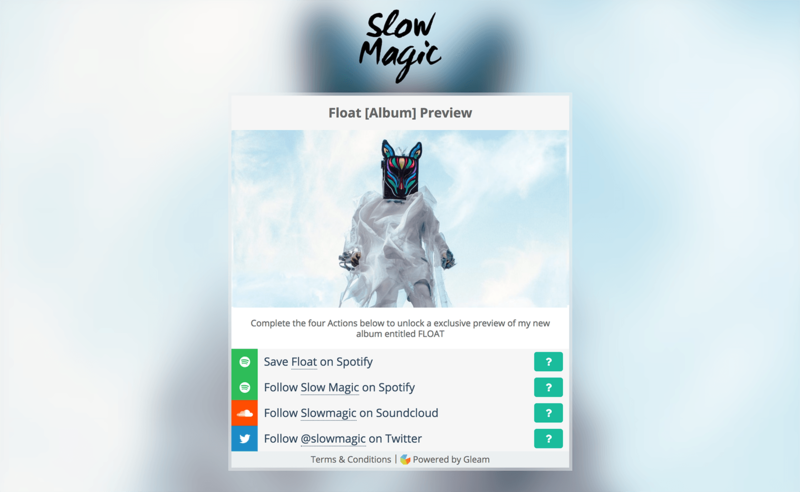 In addition to revealing the download button in the widget, the user will also get an email with the download link attached - provided that you check the Capture user details box during setup. 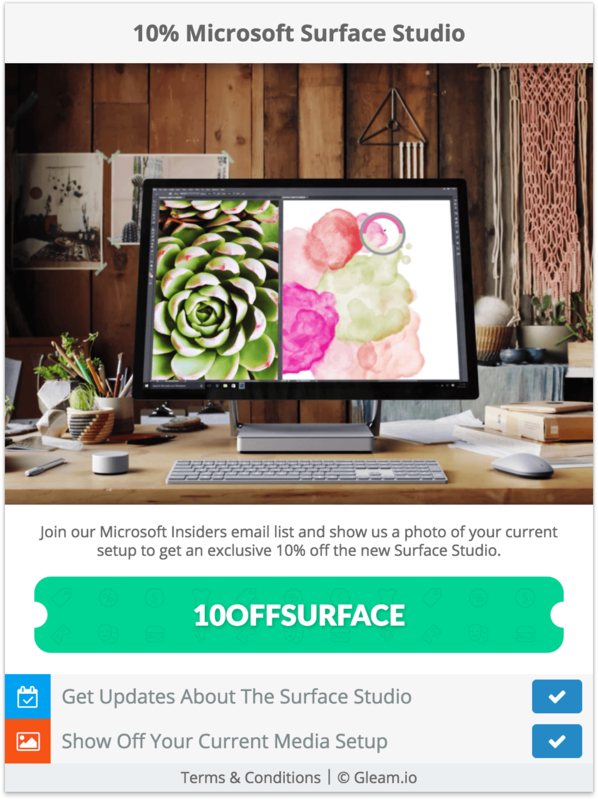 These emails can be customised on your own if you upgrade to Business plan. We currently do not host files on the Gleam platform, but you can host your Download file with a realiable service such as Dropbox. 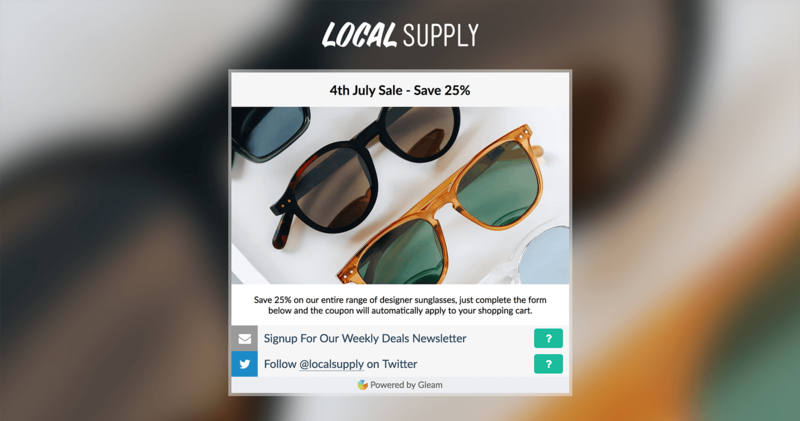 Links can be delivered instantly inside the widget or via email. In addition to revealing the link in the widget, the user will also get an email with the link attached - provided that you check the Capture user details box during setup. The Redirect widget offers an easy way to redirect users to a desired location once they complete the required actions in your campaign. 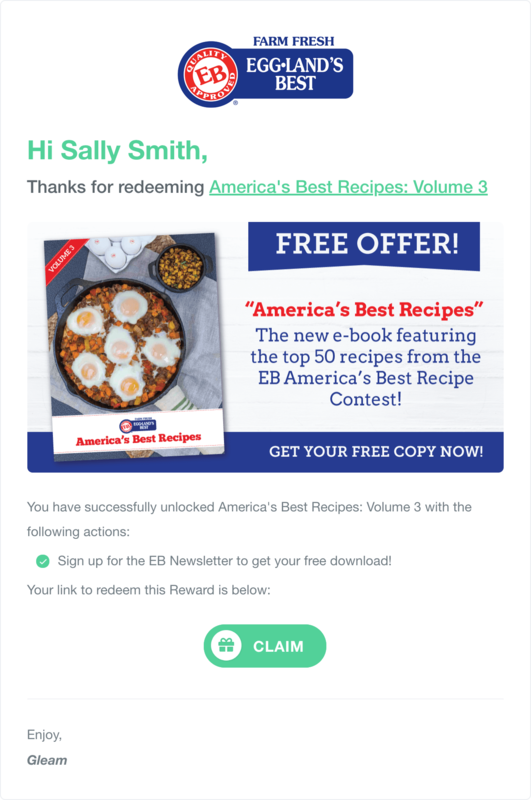 This particular reward type is also great for gated content like Links or Downloads, except the user will be redirected automatically once they complete the required actions. User will be redirected instantly from the widget once the required actions are complete. Additionally, they will also receive the link in an email. There is no need to do anything once the required actions are complete, we will automatically redirect the user to your specified URL. In addition to being redirected automatically from the widget, the user will also get an email with the redirect link attached - provided that you check the Capture user details box during setup.